Inaction is action. It's easier said than done. By the same token, boring is rewarding. But it's hard to get oneself excited about boring stuff. It's very satisfying to hunt for and uncover undervalued stocks. The thrill is hard to resist. But the goal of investing is not to indulge one's adventurous soul or to satisfy one's ego. The goal is to compound one's wealth. Very often, the real gems are something we already know. It's boring to recycle old ideas. Yes. But being boring makes money. It compounds. I wrote about Advant-e (ADVC) in 2012. That was actually the first post on this blog. (Now looking at my records, I realise I actually started buying ADVC in 2011.) I won't repeat all the details here. You can go back to read about it yourself. At the time, I believed ADVC was a quality business, a hidden champion. It should comfortably deliver 15% return per annum for very long time. In a more favourable business environment, it wouldn't be a stretch to get 20% p.a. return. Share price was then $0.20 and P/E was about 10x. Fast forward to today. Price is $0.40 and it is still trading at a multiple of 10x. In between, ADVC has distributed some very generous dividends. My total return (on a constant currency basis) is about 100%. Annualised return is about 30% p.a. Numerous value bloggers have written about ADVC over the years. The most recent spike of blog posts was seen towards the end of 2013, when ADVC decided to stop filing statements with SEC, coupled with a reverse-split and a force cash-out for the investors with less than 10,000 shares. Some investors were pissed off, believing the entire exercise was unfair towards minority shareholders. When the CEO Jason Wadzinski controlled over 50% of the company, they had reasons to worry. Eventually, the company went dark as planned but the reverse-split was called off, of which the true reason will probably never be known. Since then, the company has been forgotten. I hold a different opinion. In 2012, I said Wadzinski was shareholder friendly. My stance hasn't changed throughout the going-dark incident. Remember this is effectively his company. If he wanted to pay himself big salaries but distribute no dividends, he could have done so. But he hasn't. From ADVC's history, what Wadzinski has said and what he has done in the past, he strikes me as someone with integrity. When a company goes dark, apart from being less liquid, the worry is: what will happen to its dividend policy and reporting policy? Now we have the answer. On April 28th ADVC sent its shareholders a letter from the CEO with a condensed annual report, declared a 5% dividend and announced a share buyback up to ~6% of its market cap below $0.37. While the company is definitely less transparent than it was, my assessment of its business hasn't changed. Its moat in its own turf in the grocery market is solid. And it's slowly making inroads into the automobile market and the healthcare market. Monish Pabrai said in a recent interview the holy grail of investing is to identify compounders with hidden moats. That's superior to buying cheap assets at 40c on a dollar. He didn't elaborate why. But it's self-evident. Instead of constantly and actively searching for your next preys, you collect money from a compounder when you are snoring. ADVC is one such little compounder. It is my benchmark (or in Buffett/Munger's vocab, my "cost of capital") when I assess other investment opportunities. "Should I buy XYZ, or should I buy more ADVC?" This is my way to avoid making further stupid mistakes. p.s. I respect the company's decision not to make their financials public. If you want to have a glance of their 2013 numbers, you can simply buy a few shares and ask the company for a copy. Most people know CeBIT and CES, the annual trade shows for hi-tech products. Imagine now I challenge you to start an exhibition organiser (EO) to run a new trade show to compete with CeBIT and CES. Will you take up my challenge? You: Would you like to book a booth at our new MobileTrend 2014 exhibition which will be held at Vegas this summer? Vendor: No thanks. I will be at CES in January. I don't think I have the resource and energy to exhibit twice a year. You: I can give you irresistible discount. I think you are paying $7,000 for your CES booth? You see, I can offer you the same 3-sided booth at MobileTrend for only $3,500. Vendor: That's very kind of you and it definitely sounds very attractive. But I have no idea what foot traffic and what kind of visitors your exhibition will attract. Vendor: How about this. You call back in 2 years. If your show turns out to be successful, I will drop CES and take up yours. EOs are in very interesting businesses. Can you distill their businesses into a simple mental model? Can you see which another familiar business it resembles? Although eBay works at a much larger global scale and an EO works in very local vertical markets, both exhibit network effect. At eBay, you need buyers in order attract have sellers; and you need sellers in order to attract buyers. Similarly, in exhibitions, you need visitors in order to attract exhibitors; and you need exhibitors in order to attract visitors. Mature markets are dominantly by one or two big EOs. Once an EO incumbent has established its market position, it's virtually impossible to displace it. This is kind of first mover advantage that drove people nuts in the dot-com days. So, here you are. EO businesses have moat. Now, imagine I have this EO which owns a portfolio of exhibitions for various industries. They are not as big or as prominent as CES or CeBIT. Nevertheless, these exhibitions are profitable and are the market leaders. How much are you willing to pay for such business? What multiple will you pay? How profitable, you ask. You see, EO businesses are asset-light businesses. There is no expensive machinery or significant hard assets. The ROE of this particular EO is north of 30%. And it is achieved without debt. Got a valuation in mind yet? Great. Let me reveal a bit more about this business. Its exhibitions are operated primarily in emerging markets with high GDP growth. To take advantage of the growing markets, it spends about 50% of its profit on bolt-on acquisitions, 15% on organic growth and it pays out the remaining 35% as dividends. Essentially, its strategy is to take its existing operations as a template and clone it across different industries, different locations and different countries. Are you revising your valuation? What if I tell you can buy this company at 15x ttm after-tax profit? Will you buy it? Take a pause and think about it. Let me reveal yet a bit more about this business. Since it has been acquiring businesses over the years, it has to amortise certain acquired intangibles like customer relationship. Such amortisation is pure accounting treatment which doesn't reflect the actual economics of the business. As long as the exhibitions are well organised, the economical value of the acquired customer relationship won't fade away. There is no extra maintenance capex you have to spend to maintain this asset. Adding back the amortisation, this company is actual available at 11x after-tax earning. Wait, there is more! Since exhibitors prepay for their bookings, this company runs with negative working capitals. In other words, it has float. Net float makes up 20% of its assets. When the business expands, this float grows too. This company's expansion and operation are partially funded by its customers. Where can you find such an attractive investment?! The company in question is UK company ITE Group (ITE.L). Too good to be true? What's the catch? Here is the catch. Remember I said "emerging markets"? More the 60% of ITE's business is in Russia. ITE also operates in Ukraine and other East European countries. Since the outbreak of the crisis in Crimea and Ukraine, ITE's market cap has fallen more than 30%. But the market's fixation on this crisis is our opportunity. It's time to be greedy when others are fearful. ITE has been around since 1991. It has prospered through the 1998 Russian financial crisis, the 2008 Russian financial crisis and the 2008 Russo-Georgian war. Its bullet-proof balance sheet and the strength of its business model will give it the staying power to weather this political hurricane just like how it did it in the past. ITE has the characteristics of the holy grail of Buffett-style value investing. It has moat. It has high ROE. It is asset light. It has float. It has a big enough untapped market in front of it to redeploy its cash flow and float, to recycle its business model. It is a compounding machine. The real risk of this business is losing its key personnel on the ground in Russia. But this risk is forever present for ITE and has nothing to do with the current political uncertainty. (This will probably be the topic of another post.) Besides, growing by acquisition is risky; expanding into other countries is also risky. There is no guarantee this business won't stumble. 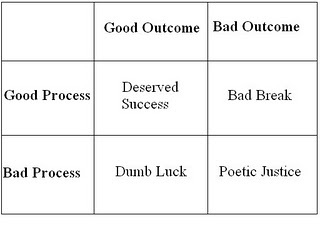 However, the current price offers enough margin of safety to overcome all these risks. With a time horizon of 5-10 years, we are in for a double-dip. When the fear of the war subsides, we will firstly be rewarded with a proper P/E expansion. But a quality business is still a quality business. It will continue to compound internally. We can sit back and be rewarded with satisfying return for many years to come. p.s. Thankyou to Richard Beddard (@RichardBeddard) for the lead. Nam Tai Electronic (NTE) is a contract electronics manufacturer with factories located in China. It has a market cap of $270m and no debt. It's been in business for 40 years and listed on NYSE since 2003. It business has changed and gone through many phases. Currently it assembles LCD modules (LCM), with Apple as the primary customer. It has always been profitable and has never lost a single dime in the last 10 years. However, it has warned investors in the recent years competition is intense and its contracts could end abruptly. On Jan 27, it confirmed it would receive no more orders and all production would be terminated for good in April. It also confirmed it would exit its existing lines of business completely. NTE is a net-net with a hidden asset worth multiple of its existing market cap. Its management is competent and aligns with shareholders. Catalyst is already in place. The management has committed to realise its value. At the time of writing, NTE is trading at around $6. Current assets less all liabilities is $300m ($6.65 per share) and book value is $360m ($8.10 per share). In other words, NTE is trading at 10% below NCAV and 25% below BV. And most of the current assets is cash. The number one risk investing in any company with any China connection is fraud. In the case of NTE, this risk is virtually zero. Every evidence indicates it's a legitimate business run by a legitimate businessman: Its primary customer is Apple. It sells real electronic components and receives real cash. In the last 5 years, it distributed $58m dividends in total with an average payout ratio of 70%. There was no capital raising nor debt. Or we can look at it from the history perspective. Nam Tai was founded by Hong Kong entrepreneur Koo Ming-kown (as in Chinese tradition, the surname goes first; so, "Koo" is the surname). He is currently NTE's Chairman and CFO and holds 11.7% of NTE. Another director Peter R Kellogg holds 14.4%. NTE's history shows Koo is an opportunist and capital allocator. NTE's business has gone through 3 major transformations in the last 4 decades. NTE started as a distributor of Japan-made calculators. At its peak, about half of the calculators used in Hong Kong were imported by NTE. In 1979, taking advantage of China's economic reform, Koo expanded the business into China and started manufacturing his own brand of calculators in China. Later, around 1985, economic environment became harsh and NTE's business went downhill. With its existing relationship with Japanese manufacturers, Koo seized the opportunity to transform the business again to export electronic components and raw materials from China back to Japan. 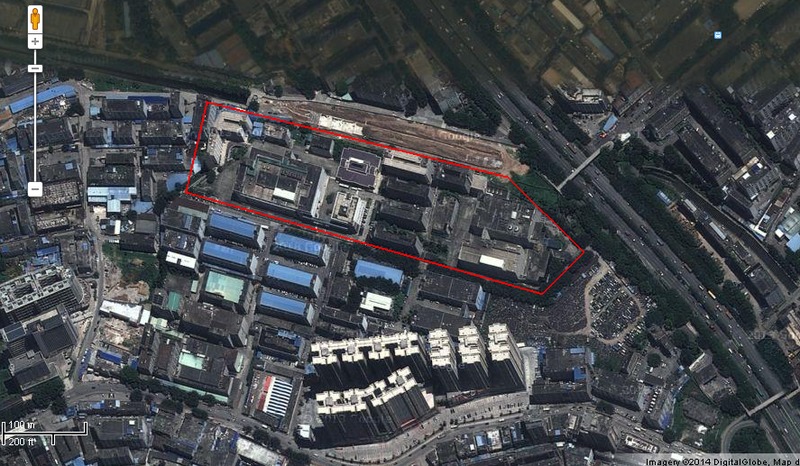 One of NTE's factories locates in Bao'an, Shenzhen, China. NTE now intends to redevelop this land into a commercial complex and become a property developer and manager. A quick discussion of the economic backdrop of this region is warranted here. 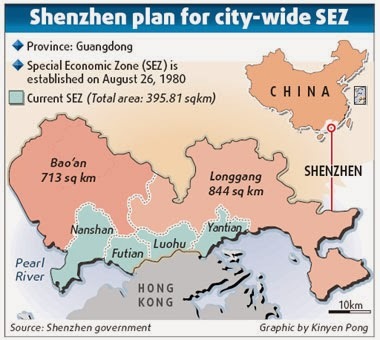 In 2010, Chinese central government extended the Shenzhen Special Economic Zone (SEZ) to include Bao'an and Longgang. Besides, Qianhai, the bay area in Nanshan, is earmarked to be turned into an international financial services centre. It is China's ambition to have its currency RMB playing a more significant role in global finance. NTE's factory is 7km from Bao'an CBD, 12km from Qianhai CBD and 10km from Shenzhen's international airport. Local government has recently been rezoned the region from industrial use to commercial use. "A" is NTE's site. Left box is Shenzhen's international airport. Middle box is Bao'an CBD. 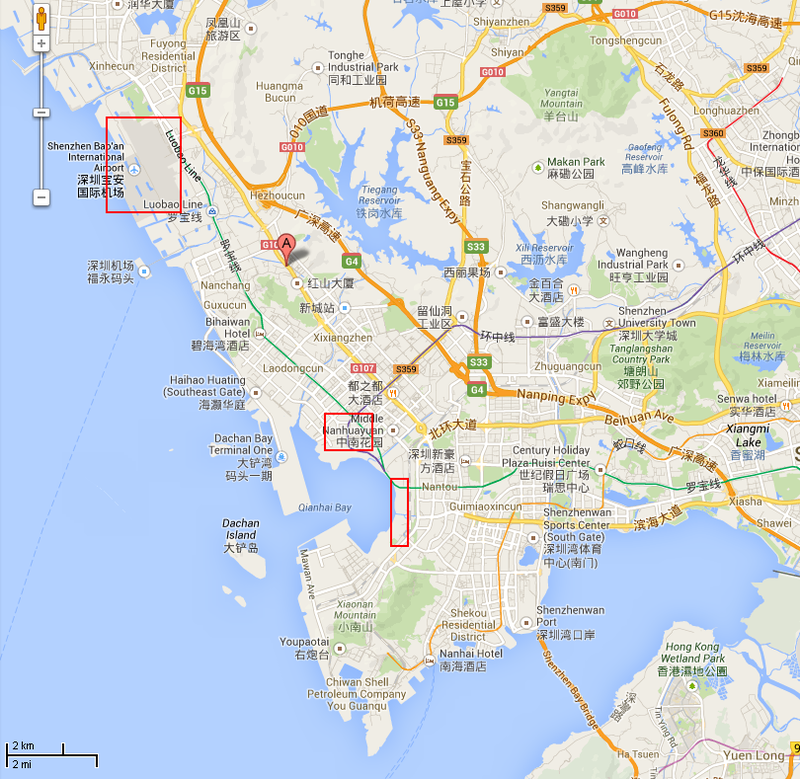 Right box is Qianhai district. In China, like Singapore and Hong Kong, lands are not bought. Instead, land use rights are leased. The total historical cost of land use rights is stated at $10m on NTE's balance sheet. Bao'an site makes up probably less than half of that. i.e. it makes up less than 1.5% of the its book value. In other words, it's not material. NTE's site has a land area of of 52,600 sqm. It can accommodate a business complex with a plot ratio of ~6. That means, after redevelopment, it will have a 300,000 sqm gross floor area (GFA). How much is this land parcel worth now after the rezoning? We can look at comparable land sales (or more correctly, auctions of land use rights). Two parcels of land in Qianhai with plot ratio 6.5 & 7.8 (T201-0077 & T201-0075) were auctioned in July 2013 and sold for ~$2,700 per sqm (GFA). Sale prices were ~50% higher than the opening prices. But that's Qianhai, the red hot region in recent months. How about Bao'an? Two parcels of land in Bao'an CBD with plot ratio 6.0 and 8.1 (A004-0154, A002-0046) are currently listed with opening prices at around $2,100 per sqm. Two years ago, a parcel of land a couple of kms outside CBD (A002-0042) was sold for $1,600 per sqm in Jun 2012. So, if NTE's land can command $1,000 per sqm, it will be worth $300m. If it can command $2,000 per sqm, we arrive at a more aggressive value of $600m. Adding this back to the book value, we are looking at a value of $14 to $21 per share. Alternatively, we can look at cash flow. NTE has commenced 3 feasibility studies for the project from 3 different consulting firms. The recommendations centre arround building a mix-use complex consisting of a hotel, offices, R&D offices, retail space and residential apartments, and some combinations of these. With assumed rental charges in the range of $0.8 to $3.0 per sqm per month (if you consider the current rental market in the area, these rental rates are very reasonable), the expected net rental cash flow will be in the vicinity of $50m per annual. If you apply a very conservative 10% capitalisation rate, the complex will be worth $500m (in 3-4 years). Apply a more aggressive cap rate of 7%, you will get $700m. i.e. We are looking at $11 to $16 per share. Here, we haven't added back the book value because the development will consume cash. However, it is almost a certainty NTE will mortgage the land to fund the development. There will be un-utilised asset value not accounted for here. The main give-away is the 11% drop on Jan 27th when NTE announced it would cease all manufacturing and committed itself to develop its lands. Its existing shareholder base sees it as a electronic manufacturer with good dividends, not a property developer that won't be able to distribute in the next few years and needs to lever up the balance sheet. Second, value investors who screen for cigarbutts will shun the stock with its China connection. Third, its small $270m market cap is pretty much not on most fund managers' radar. Koo is 70 this year. NTE is his company. Without him, the direction of the company is completely unknown. Second, my contact in China who is familiar with its business environment and property laws told me there is a real chance the local government will not approve NTE's redevelopment plan. Typically, the local government will have a lot of financial incentive to take back the lands and then auction them off. It will pocket the hefty profits while the original property owners will only be compensated for what the lands were original designated for. e.g. Another industrial land in a nearby region. Besides, the local government favours established larger developers and give them significant advantage. However, the feasibility studies indicate the local government is "supportive" of NTE's project. One possible explanation is NTE's project fits well in the government's overall agenda. They want to fast track the redevelopment of the entire industrial region. There are rivalries between different SEZs. They are willing to give up a very small value in the overall scheme of things in order to get a pioneer to create a showcase. In addition, Koo's 3 decades of business relationship will the local government should also count. Undoubtedly, we have to trust Koo's experience and judgment here. But even if the project is rejected by the government, what do we lose? We are still holding onto $1 worth of asset value that we have paid only 75 cents for it. Third, if the redevelopment goes ahead, we won't see any cash flow for 3-4 years and NTE will lever up its balance sheet. Besides, China's grand policy plan for the Qianhai and Bao'an will take years to materialise. So, you need a 5+ years time horizon to invest in NTE. Fourth, I've said for years China will slow down in the coming decades. We now start to see this effect on Australia's mining sector and its currency. In addition, China's huge debts in its shadow banking system is destabilising its economy. The chance of a catastrophic collapse of its economy or property market is remote but possible. This can derail the planned economic development of the region for 5 to 10 years. Or more. One way to look at this investment is, it is buying a property development project at a discount. Another way to look at it is, the property development project has tremendous option value. We are effectively getting paid to hold this option. How often do we see management of companies operating in deteriorated business environments hanging onto their status quo, knowingly to lose money years in years out, hoping to "turn around" the businesses? When the market sees NTE's exit from its existing business a negative, we should see it a strong positive. Koo refuses to continue to operate a business that will no longer earn its cost of capital. It is Koo's brilliance to turn hindrance into opportunity. We have seen it happened before multiple times in NTE's history. Buying NTE is to bet that he will do it again. But strangely, this bet costs us nothing. Koo commented on its redevelopment plan (July 2013, news piece in Chinese) - He speculated the land was worth RMB 9 billion! (USD$1.5B). *I didn't discover NTE myself. The credit goes to Batbeer2 who published an investment case on Gurufocus in July 2013. I also owe Batbeer2 a thank you for flushing out some of the details.